The words of the ‘Sankofa’ bird were written during one of many dancing, singing, making and music workshops that took place in the lead up to the Trashcatchers’ Carnival in July 2010. Sankofa is a mythical creature, carrying a seed of the future under its wing and looking forward to the future and back to the past in a single glance. 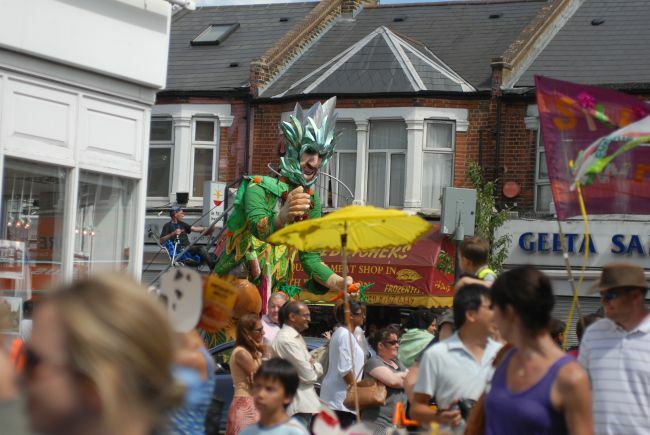 The bird, along with a Giant Turtle; a Lady of Tooting and the Green Gardener (as tall as houses) led the Carnival down Tooting High Road, accompanied by 800 ‘carnivalistas’ and 1000s of onlookers. 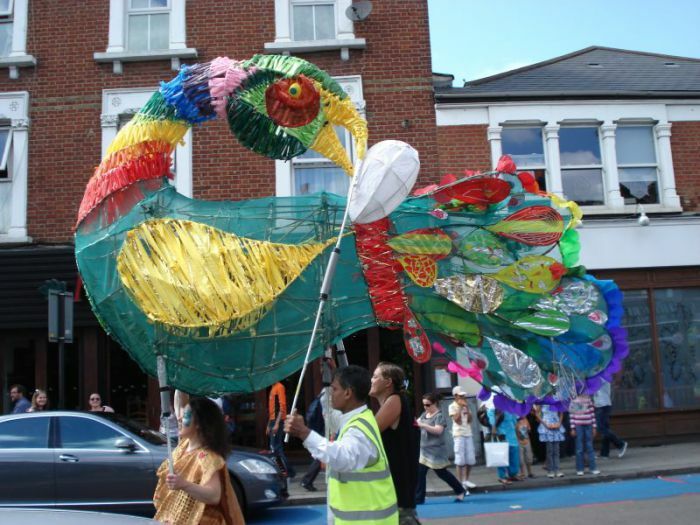 For a year, the Carnival rallied people to re-imagine Tooting; celebrate a relationship to Earth; make beauty from rubbish and use recycling as a metaphor for change. ‘Carnivalistas’ were convened from youth clubs, secondary and primary schools, the Asian elders, Share Community Gardens, Sports clubs, local residents, choirs and arts projects – across generations and cultures. Peak oil and climate change workshops formed part of the work carnivalistas undertook over the year. Smaller ‘convening’ circles got the process going: TTT, leading the event, worked with professional artists Project Phakama and Emergency Exit Arts who brought scale, humour and skills. Local champions, including the local Police, the Waste department at the Council and the Town Centre Manager were recruited to help find spaces, resources and support. Local businesses, the Tooting Business Network and the Balham and Tooting Community Association, (formed in the wake of the 2005 London bombings to honour Tooting’s strength in diversity) were valuable collaborators. We looked to involve not just the community of Tooting, but the communities of Tooting. It was a tall order to close one of London’s busiest ‘arterial traffic corridors’ in addition to transforming an abstracted sense of a possible future into a carnival from scratch. Milk containers used by worshippers at the Sivayogam Hindu Temple were diverted to schools to be made into baby elephants. Collection of bags, tins, bottles and crisp packets went into overdrive. Large fish, elephants and octopuses took over entire school halls. The Carnival, processing triumphantly down the High Road, turned Tooting on its head for the day. As we convened for the finale on Fishponds field, people gathered in a circle to admire what we’d all made. We were Sankofa’s flock nesting on the Rock. A story we’d made had started to make us. We convened around the imaginary. Sankofa and other characters, brought magical qualities to the event. They gave us imaginary space to extend possibilities for ourselves and the town: we were all equal, all capable, all included. A sense of new opportunity became tangible. If we were capable of this, what else was possible? 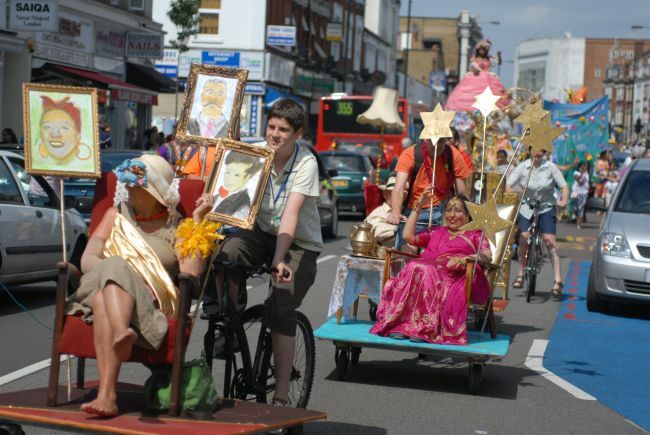 Five years on, Transition Tooting has two events simmering away that have their root in Transition as Convener and look forward to the future after reflecting back to the Carnival of 2010. These projects are mid-process, and have begun with the idea of holding a space open to conversation, without articulating a specific outcome. On April 11th this year, TTT will invite local groups to participate in “Looking Out for Tooting”, or LOFT. This event celebrates the people and groups that care for Tooting and its future. It will be a gathering, engaging the energy of local activism, acknowledging the reality of Tooting today and our unique ability to imagine our collective future. It will offer all those present an opportunity to recognise, celebrate and catalyse those values that are common, whether that be between individuals, groups or the whole gathering. This idea of celebrating and valuing diversity, born from resilient natural systems and articulated in David Holmgren’s Permaculture Principles, is the seed around which this idea has grown. It feels strong as a reason to gather, without dictating outcome. As a frame, it helps us to listen and to share our stories, reflections and care for the future within a supportive environment. The gathering will help us look at this wonderfully diverse area of South London in a new light, taking inspiration from the idea of Lookout – a place from which we keep watch and observe, in one definition and a person who sees what is coming, either physically or in looking to the future, being aware of change and trends, in another. From the outset it wasn’t at all about TTT leading a powerhouse of local activism, but about TTT taking the first step onto the dancefloor and ask what makes our local area special to us? Could we look to the future together? How would one encourage multiple, different and ever changing partnerships over time? Our second event is a pre-election event about local sustainability. Inspired by 2015 being an election year, we asked the question, “how could we gather as many local people as we can and ask them to come up with a macro-scale vision for Tooting to be addressed within our political structure?”. Using the World Café format, the conversation will be in three parts, breaking the group up into 6/8 people tables to help us hear from everyone and enable conversation to develop around specific areas. After a welcome, the event will invite personal views of Tooting’s past – what do we value and what lessons can we learn from our individual experiences? The second conversation will be based around local community seeking our collective concerns for the present. The third, perhaps longer, conversation will explore our hopes for the future of Tooting, expanding our thoughts to include the whole local area. This framing will help us facilitate a conversation without dictating the terms. It also allows us, as conveners, to have a structure, but be able to respond to the participant-developed content to inform the next steps. It will be critical to observe well, and keep light footed to guide the group through the event. We will encourage a panel of ‘VIPs’ to participate, as Tooting citizens, and come together towards the end of the event to respond to proposals from the final World Café table. The panel will include teenagers, politicians, scientists and local citizens. We can see synergies in the idea of convening and hosting in the root of Transition thinking, using Permaculture’s Principles as an inspiration for open and rich conversation. Also, Open Space Technology in hosting conversations without dictating agendas is hugely helpful in empowering participants to be heard and World Café’s maxim to create the right environment for conversation encourages us to turn down the volume of ego and increase our ability and sensitivity to listen and give time to points of view. But most of all, Transition’s sensitivity to heart as well as head, emotion as well as rationality in responding to Climate Change makes for a compelling starting point to instigate conversation and mobilise engaged participation, ensuring a very human scale outcomes to be found. Lucy Neal and Richard Couldrey. “Tooting” – a name thought to originate in Saxon times, derived from the verb ‘to tout’, meaning to look out (which is, interestingly, the same derivation for the ‘Tot’ in Totnes [Rob]).